Lawn fertilization in Millard makes your yard more attractive yard affects the overall appearance of your home. Properties with healthy lawns are not only more visually appealing but also have higher market values. If you need help maintaining your yard’s beauty, turn to Heroes Lawn and Landscape for lawn fertilization in Millard. Through lawn fertilization in Millard, we can transform even the most lifeless yards into stunning, picturesque landscapes. Our comprehensive program for lawn fertilization in Millard is tailor-made for the weather conditions in the city of Omaha. If you rely on us for lawn fertilization in Millard, you can have peace of mind knowing that your beloved yard is in good hands. Every homeowner deserves a lush and attractive lawn. However, you’ll need to keep your soil healthy if you want the grass to thrive. This is where lawn fertilization in Millard comes in. At Heroes Lawn and Landscape, we are dedicated to helping you maintain your yard through lawn fertilizing in Millard. When you turn to Heroes Lawn and Landscape for lawn fertilization in Millard, you will be sure that your yard will get the full treatment. Our services offer thorough lawn care services. Our program for lawn fertilization in Millard consists of adding the right fertilizers to the soil, treating weeds, and creating protective barriers against crabgrass, broadleaf weeds, and other unwanted grass. Aside from lawn fertilization in Millard, our lawn care services include aeration and seeding. These services will not only improve the health and appearance of your yard but also provide the best defense against weeds and insects. Timing is crucial for lawn fertilization in Millard. Applying fertilizers at the wrong time can lead to uneven or overgrown lawns. To keep your garden in its best state, ask the professionals at Heroes Lawn and Landscape for lawn fertilization in Millard. Our services treat your yard according to the demands of the season and base our treatment plan on your lawn’s particular needs. Since we care about your health, our services include the safest possible methods for lawn fertilization in Millard. The products and equipment we use for lawn fertilizing in Millard will not harm your family, pets, and the environment. Additionally, our services for lawn fertilization in Millard provides a necessary mix of macronutrients and micronutrients to keep your turf healthy. While it may be tempting to try fertilizing your yard on your own, asking for professional help is always the wiser idea. 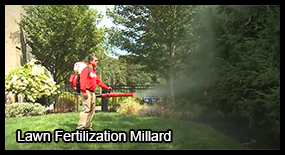 Performing lawn fertilization in Millard requires the right knowledge, skills, and equipment. The lawn care experts at Heroes Lawn and Landscape have all of these and more. As we perform lawn fertilization in Millard, we make sure to use the appropriate equipment and products. With professional lawn fertilizing in Millard, you won’t risk putting the wrong fertilizer on your lawn. This will also avoid uneven applications that lead to patchy and messy grass. Whether you’re looking to get rid of weeds in your yard or protect your garden from insects, the professionals at Heroes Lawn and Landscape are here to help you. You can learn more about us by visiting our website. Call us for lawn fertilization in Millard, and you’ll have a lush and healthy turf in no time! Do you want a new look for your surrounding outdoor spaces? Turn to Heroes Lawn and Landscape for expert landscape design and maintenance services. Our team has the skills, experience, and equipment to implement a full-scale landscape design project for residential and commercial clients. We meet with our clients first so we can fully understand their goals. Also, we provide regular updates throughout the course of the project to ensure that our clients and our team are on the same page.